If you suffer from chronic back, neck or other muscle/joint pain, consider either steroid injections or trigger point/muscle injections. Both can temporarily relieve pain and reduce inflammation near the affected area. This can allow for more effective treatments and can reduce overall treatment time, but are usually only utilized after other forms of therapy have been attempted. Epidural steroid injections are usually limited to just a few a year because there's a chance these drugs might weaken your spinal bones and nearby muscles. This is not caused by the needle, but it is a possible side effect of steroids. The risk of these side effects increases with the number of steroid injections you receive. Short-term complications may include shrinkage (atrophy) and lightening of the color (depigmentation) of the skin at the injection site, introduction of bacterial infection into the body (such as a joint infection), local bleeding from broken blood vessels in the skin or muscle, soreness at the injection site, and aggravation of inflammation in the area injected because of reactions to the corticosteroid medication (post-injection flare). Tendons can be weakened by corticosteroid injections administered in or near tendons. Tendon ruptures as a result have also been reported. Facial flushing may occur in up to 40% of cases but lasts only briefly. In people who have diabetes, cortisone injections can elevate the blood sugar. In patients with underlying infections, cortisone injections can suppress the body's ability to fight infections and possibly worsen them. This can also result in infections being masked by suppressing the symptoms and signs of inflammation. Generally, cortisone injections are used with caution in people with diabetes and avoided in people with active infections. Cortisone injections are also used cautiously in people with a bleeding disorder. Long-term complications of corticosteroid injections depend on the dose and frequency of the injections. With higher doses and frequent administration, potential side effects include thinning of the skin, easy bruising,weight gain, puffiness of the face,acne(steroid acne),elevation of blood pressure,cataractformation, thinning of the bones (osteoporosis), and a rare but serious type of damage to the bones of the large joints (avascular necrosis or osteonecrosis). Steroids injected into the spine—typically in an area called the epidural space, between the vertebrae and the protective covering of the spinal cord—can temporarily reduce inflammation around the irritated nerve. But three professional organizations—the American Pain Society, the American Society of Interventional Pain Physicians, and the American Academy of Neurology—recently reached the same basic conclusion. While some evidence suggests that the shots can ease lower-back pain caused by nerve problems in the short-term, they're not going to provide long-term benefits. The neurology group, for example, concluded that treatment had no impact on functional impairment, the need for surgery, or pain relief beyond three months. Studies focused only on back pain (not radiating to the leg) have concluded that there is insufficient evidence to support the use of any type of injection therapy for pain that is only in the lower back. 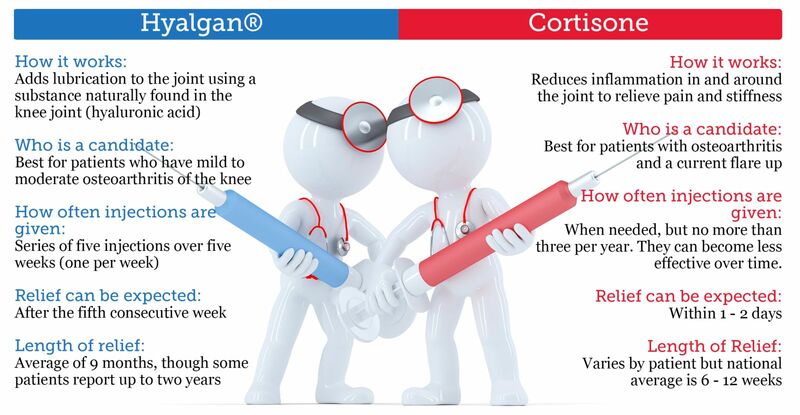 To see if Cortisone is an option to help you, call us at (708) 385-4416 and schedule an appointment today.